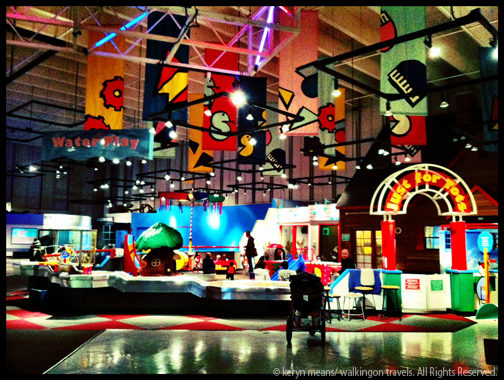 Don’t let the Just for Tots zone scare you. 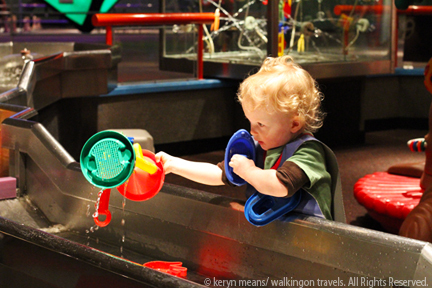 There is plenty for parents to enjoy throughout the museum with their kids, including the toddler area. I’ll admit it again. I’m just not that into kid activities. I avoid massive crowds of toddlers at all costs. I just figure there is always something else Dek and I could be doing that is just as fun and we can both enjoy. Dek and I haven’t actually been to many museums; definitely less than 5 that I can think of in Seattle. I just figured he won’t be interested in them yet. Apparently I don’t know how old Dek is. He is at the perfect age to go to museums! There is so much to see and explore. Nothing could have proven this more than our trip to the Pacific Science Center, Seattle’s very own science museum. When my friend Jen suggested we check it out last week I was a bit skeptical. It would be on a weekday morning so maybe it wouldn’t be that crazy. How many field trips could there be? The price was a little steep but at least Dek was still free to enter. We headed out to see what kind of fun Dek could have. I was already resigned to the fact that I would spend the entire trip corralling him and making sure he didn’t take down the museum. I had no idea there would be so much for me to see too. We started our adventure with a stop in the toddler zone. Things to climb, buttons to push and water to splash in filled a large enclosure built for kids under about 4 feet tall. It was the perfect place for Dek to explore. There were smocks the kids could wear while playing with the water troughs. I thought this was a genius idea since Dek loves to get soaked whenever possible. 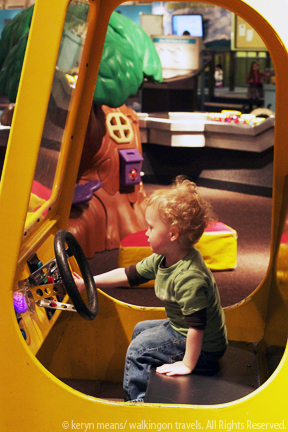 We checked out all of the vehicles in the area and hit loads of buttons that responded to Dek’s ever touch. Basically Dek never wanted to leave. He had found a place to lay down his roots and never break camp. Knowing there was still more to explore I made him pack it up and follow our little group of friends off to see some bugs. The bugs were not a good idea. There was a huge animatronics praying mantis that scared the bajeezus out of Dek. I had to carry him through. 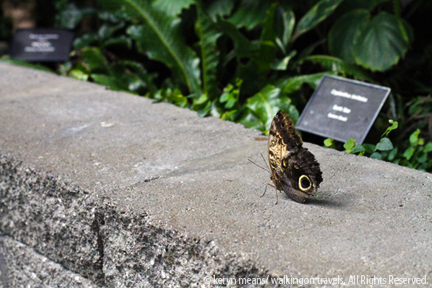 We emerged at the Butterfly Room. “What?” you say, “a butterfly room?” Why yes friends, it’s just what you think. An entire greenhouse type room that is full of live butterflies. And we got to walk through it! A volunteer gave us a run down of the rules. 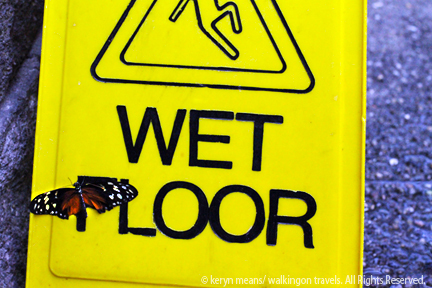 No touching the butterflies, keep your eyes peeled, especially on the floor for butterflies that might have landed. No stepping on the butterflies. I had to reiterate that last one as we walked in. Butterflies were everywhere. I was mesmerized. I had no idea that something so beautiful was right here in the city. How come no one ever told me about this? I all but ignored my son as we stepped in and I started snapping pictures. Blue ones, orange ones, little black ones with pink stripes. So many butterflies I had never seen before. I did have to come back to reality to mind my child. My friends had their hands full with their own kids. 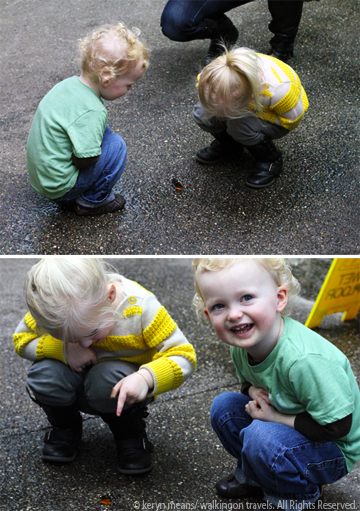 Someone had to make sure Dek kept an eye on his shoes and didn’t crush any delicate little wings. We had some very close calls. Even I almost took out one or two, but in the end we managed to leave all of the butterflies the way we left them. 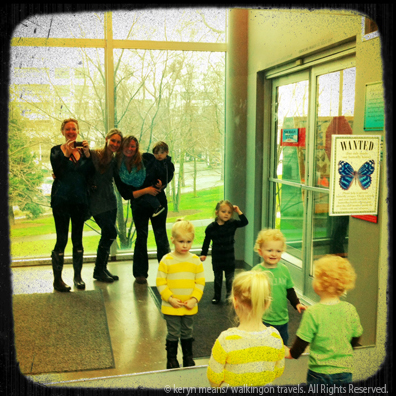 The kids were simply enchanted with these winged creatures. They would stop dead in their tracks just to get up close and personal with these small wonders of nature. I had no idea 2 year olds could stand still for so long. All too soon we were getting the once over from another volunteer to make sure no butterfly friends left the room with us. 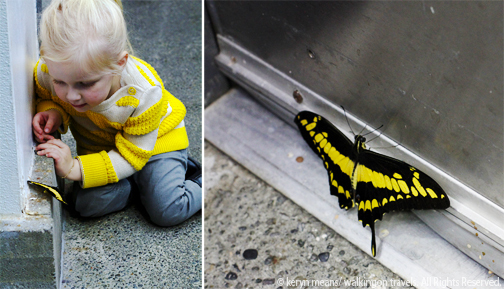 I wanted to find a bench and sit with the butterflies for hours, but we still had so much to explore, like dinosaurs. Ok, so animatronics are not our friends. I have made a mental note. After running past the praying mantis again, Dek and I entered the dinosaur room. 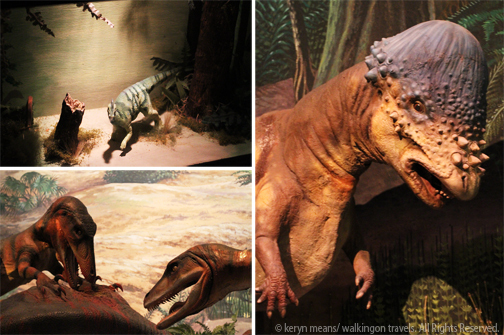 Huge robotic dinosaurs were there to greet us with grunts and roars. Dek was terrified. He tried to hide himself in my legs and cowered until I could get him out from behind me and pick him up. We stayed focused on the tiny dinosaurs in the display cases. That he was OK with. We watched an old Will Vinton claymation about dinosaurs and had a snack. Dek was OK with that too. But the big guys, no way. I had to carry him in and carry him back out very quickly. The weird thing is that he loved a huge T-Rex skull that was behind glass. He could turn a wheel to make the jaw go up and down. The combo of the glass and wheel must have made the difference. 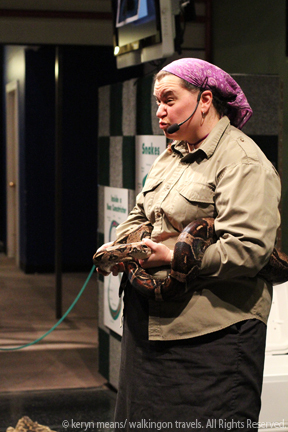 We caught most of the live snake show with a boa constrictor. My friends and I agreed that toddlers should be brought in 10 minutes after a presentation like that starts. The kids just aren’t old enough to ask questions and know to shout out what color snakes come in. They sure liked it when the real snake was taken out of her cooler though. That was definitely worth the stop. Kids worn out and only slightly traumatized by the day, we moms packed it up and headed home. 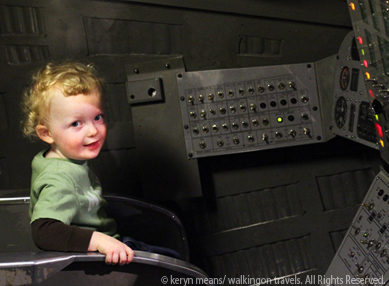 Dek and I got distracted on our way out by a replica of a space capsule. 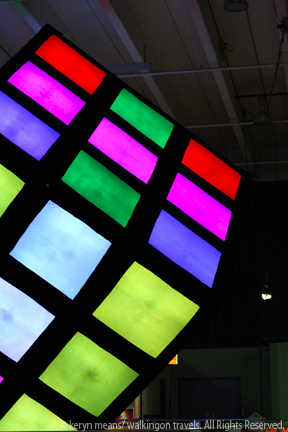 There were just too many buttons and lights to ignore. And then of course we had to stop and play with the water just one more time in the kid’s zone. We didn’t even have a chance to see the naked mole rats (yuck!) and the tide pools. I have to say I’m becoming a museum convert. 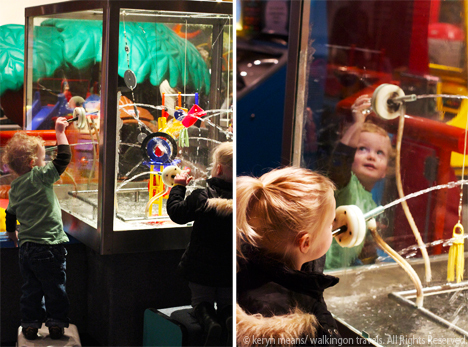 I mean I know I like museums, but I had no idea Dek would have so much fun and be so engaged. I will be back for the butterflies, while Dek will be back for more watery and vehicle fun. There was something for both of us. It was a win-win kind of day. Drive and Park: The closest parking lot is on 2nd Avenue just off of Denny. You will need to pay for street and lot parking. Free parking will be hard to find. Bus: a number of buses will drop you off very close to the museum. Check the Seattle Metro site for the closest stop to you. From downtown you can take the #1 or 2 bus. Need help capturing your own travel memories? 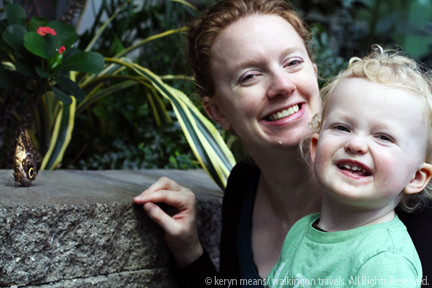 Pop over to my Simple Photo Tips When Traveling with Kids. My kids were traumatized by an animatronic dragon at West Edmonton Mall when they were Dek’s age. That stuff is scary! I love science museums! This one looks so cool! I love the butterfly photos, they are so bright and colourful! Ahhh . . . 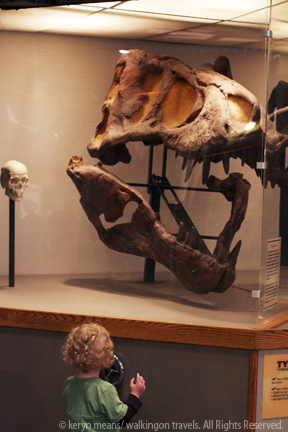 I actually miss the wonder and awe of my children in museums at that age. So cute!